Relaxed boating. Breathtaking views. Friendly folks. Looking to become a member of the Club? The False Creek Yacht Club is a private club nestled into the bustling shores of Vancouver's False Creek. Known locally as 'The Star of False Creek', our marina is home to about 100 water vessels (both power and sailing) and more than 200 full-time members. We welcome private functions in our lounge and award-winning clubhouse which boasts some of the most spectacular water views in the City of Vancouver. With ample room for dining and entertaining, the False Creek Yacht Club is one of the premier rental venues available in the Lower Mainland. Enjoy dinner and drinks surrounded by floor-to-ceiling windows overlooking the water and a beautiful wrap-around patio and a large dance floor. Full service restaurant and bar dishing up great food, friendly faces and a well-stocked bar. 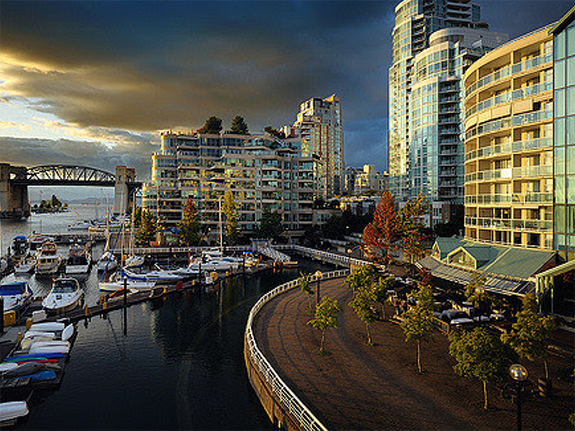 Active members receive permanent moorage privileges at False Creek marina. *See waitlist details in the Members’ Area. FCYC is proud to offer members access to about a dozen cruising and outstations in the lower mainland. Kayaks, paddle boards and folkboat rentals are available on a first-come, first-serve basis. FCYC members are welcomed at many regional affiliate yacht clubs with free or discounted overnight moorage rates. Unwind after work. Join us for dinner. Spend your weekends on the water. Our members enjoy the friendship and fun that comes along with FCYC memberships. Point Grey Bell Buoy to Snake Island. Overnight at Nanaimo YC and returning the next day. This year a DOUBLEHANDED Division has been added for the first time. Dates: Saturday, June 1st and Sunday, June 2nd, 2019. Join other boaters from various yacht and sailing clubs for friendly racing on Thursday evenings.